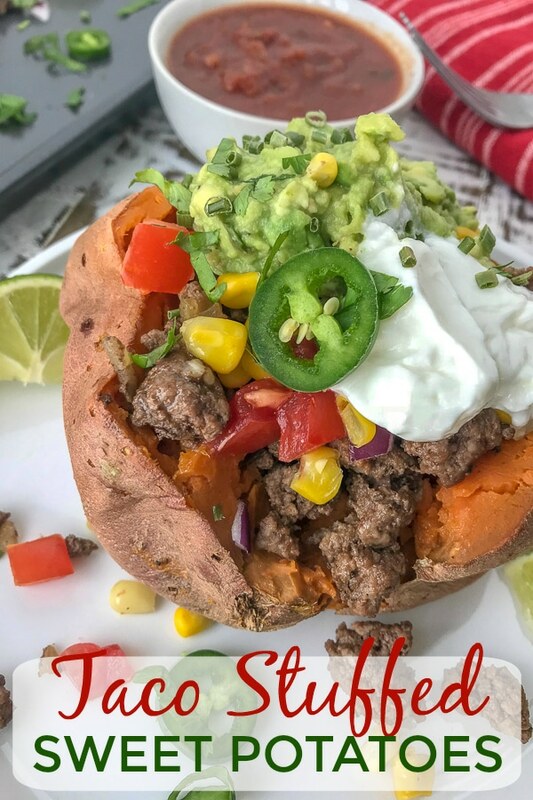 This Taco Stuffed Sweet Potatoes recipe is incredibly delicious, family-friendly, and easy to make! Clean eating never tasted so good! If you’re looking for a healthy, easy dinner tonight – this is it. Then look no further. This recipe is right up your alley. 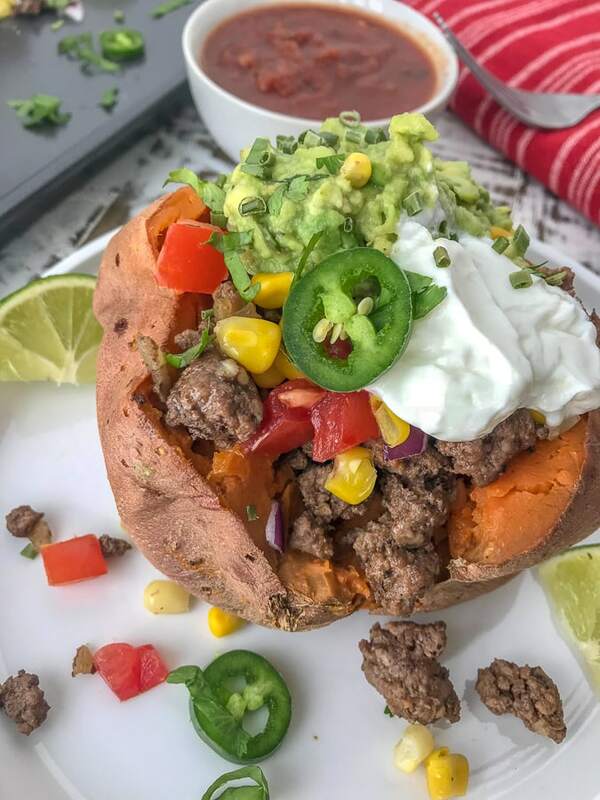 These jumbo Taco Stuffed Sweet Potatoes are stuffed with ground beef that is seasoned perfectly, and topped with corn, tomatoes, freshly shaved cheese, lime juice, and a mashed avocado blend. All the fixings and then some! 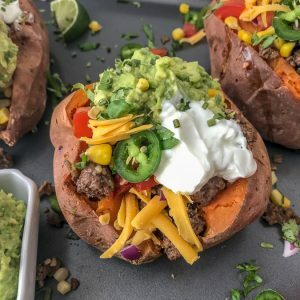 Although this recipe calls for extra-lean ground beef, you are more than welcome to serve it with ground turkey or ground chicken for a healthier, lower-fat option. We generally do ground chicken on taco nights, but for the sake of food photography – I opted for ground beef. Not just because it tastes delicious, but because it photographs a little better than ground turkey or ground chicken. Easy Instant Pot Chicken Taco Soup – Crock Pot option available, as well. Perfect for these cool months. Loaded Skinny Taco Flatbread Pizza – combining two amazing things: tacos + pizza. You’re welcome. Cheesy Skillet Taco Pasta – a cheesy taco filled pasta dish that will hit the ‘comfort food’ part of your soul. Southwest Style Sweet Potato Taco Lettuce Wraps – the perfect low-carb rendition to Taco Tuesdays. Easy Crockpot Mexican Style Shredded Chicken – a super simple, super delicious dump and go crockpot recipe. Easy Crockpot Chipotle Chicken Carnitas – another easy, flavor-packed crockpot chicken dish that is great in lettuce wraps, hard/soft taco shells, or covering a pan of nachos. If you follow me on Instagram or are subscribed to my blog, then you know what a major taco lover I am. You may have also picked up on the fact that I have a love for toppings. Truly, give me all the toppings! This post/recipe will be no different than my recent Easy Instant Pot Chicken Taco Soup – where I list off any and all taco-loving toppings. Plain greek yogurt or sour cream – I prefer plain greek yogurt. The taste is relatively the same as sour cream to me and a healthier option. Hot sauce – for those that like it hot! I like a little bite to my tacos, but not to where I can’t taste anything – like my husband. HA! Sliced jalapenos – if you’re not a hot sauce fan.. or you’re like my husband and like the heat to build until you’re almost in tears. Avocado – any which way. Plainly sliced, mashed with garlic powder, salt and pepper (like in this dish), or perhaps you would love my Avocado Corn Salsa. Diced tomatoes & freshly shaved cheese – because who doesn’t enjoy these stuffed into a traditional taco?? Salsa – Any! Make it your favorite kind! The options are truly endless! 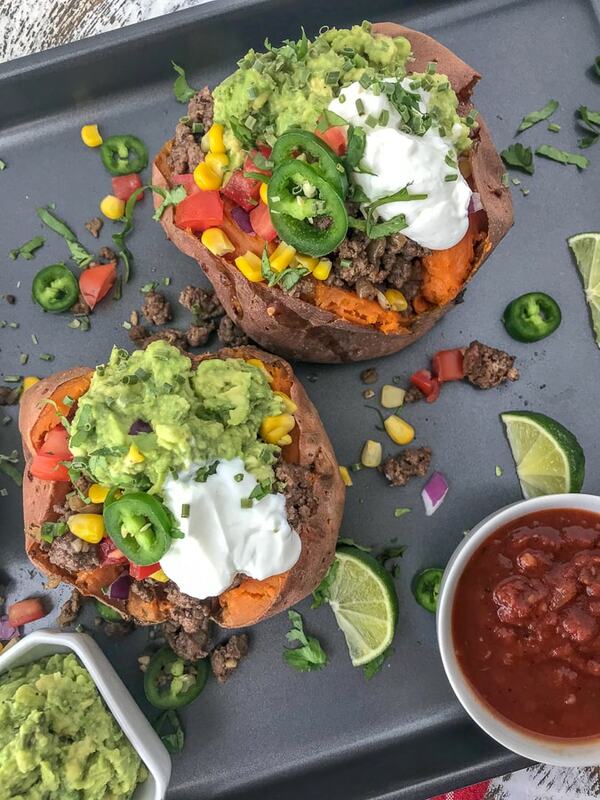 Top these Taco Stuffed Sweet Potatoes off with the toppings of your choosing! A super simple, healthy rendition to the traditional tacos we all love! Put a new spin on Taco Tuesday night with your family and try this recipe! Preheat oven to 400 degrees F. Poke each sweet potato all over with a fork. Line a baking sheet with foil or parchment paper. 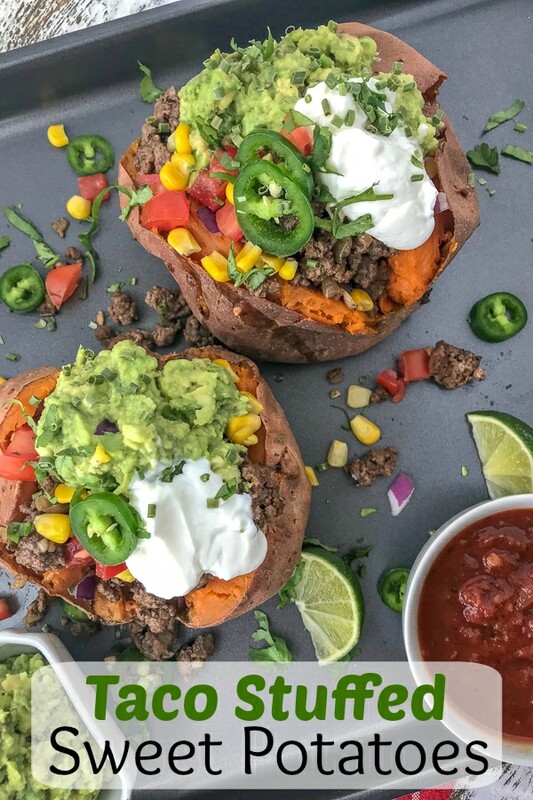 Bake the sweet potatoes for approximately 40-50 minutes, or until fork tender. During the last 10-15 minutes the sweet potatoes are baking, heat 2 teaspoons of olive oil in a large skillet placed over medium heat. Once the oil is heated, add the minced onion and cook until it has softened and the color is translucent, 3-4 minutes. Add the minced garlic and saute until fragrant, about 1-2 minutes. Add the ground beef (or ground meat of choice), breaking it apart as it cooks, so that there are no large chunks. Add the salt, pepper, chili powder, ground cumin, and cayenne pepper. Stir to thoroughly combine the seasonings with the ground meat mixture. Cook for 5-6 minutes or until the meet is no longer pink. Add the corn to warm. To serve, cut a slice down the center of each sweet potato and gently pull open. 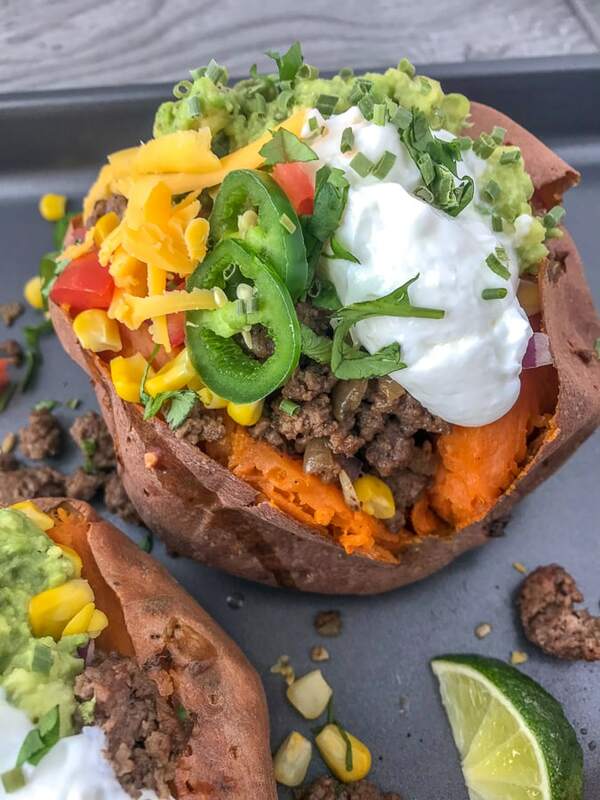 Fill each with a 1/4 of the taco filling, then top with mashed avocado mixture, shredded cheddar cheese, corn, and tomatoes.